My career as a novelist began in a bakery, which seems to me totally appropriate, because the longer I practice both writing and baking, the more similarities I see between them. Bread is a process—slow, arduous, messy, unpredictable. You can say all the same things about a book. Bread is composed of distinct ingredients—flour, water, yeast, salt—that merge and become dough—a completely different entity, a living entity which then undergoes the transformation of fire. A book is made of setting, characters and conflict and it follows the same kind of transformation process. I think of Bread as a calling and a baker as a person who can’t not make bread. Likewise a writer is someone who can’t not write. This is something you don’t discover until you’re ready. Whether it happens early or late in life is immaterial. I was 55 years old when my first novel was published. Until then I was just a woman with a very short attention span. Working in the bakery influenced not only my writing, but my whole life. There’s a kind of bonding that takes place when you cook with someone that’s hard to duplicate in any other kind of job. Sharing recipes and the act of cooking creates the very same kind of bond that sharing a story creates. It’s mostly about commonality, acceptance—the ways in which we’re all alike, rather than the ways in which we differ, the sharing of food is an act of intimacy, and so is the sharing of our stories. Even though I was there just under a year, it was one of those interludes—we all have them. They exert a kind of gravitational pull on you. You keep revisiting them and reliving them in your mind. They assume a significance in your life all out of proportion to their actual duration. I’ve never forgotten the place or the women I worked with or the great stuff we made. Other than writing, it was the only job I’ve ever had where I felt absolutely free and totally myself. If you read a lot of books you learn to recognize certain writers’ favorite emotional landscapes. Amy Tan’s is the mother/daughter relationship. Ann Patchett says the basic plot of all her novels has been a group of strangers thrown together by circumstance arranging themselves into a functioning society. My own is apparently the main character loses her way and finds herself. I say apparently, because I never set out to use this story, but it always seems to happen anyway. As it turned out, a lot of people were and are interested in reading stories with food woven into them. Sometimes the tendency is to view foodie fiction as a fairly recent development, but in fact, there are lots of wonderful descriptions of food in Charles Dickens. And what about Proust and his madeleines? In To the Lighthouse by Virginia Woolf, the famous dinner party scene has Mrs. Ramsay, the one character who is able to successfully connect with other people, serving her family and friends a beautiful meal that embodies all the nurturance and good will that Mrs. Ramsay displays throughout the novel. Food serves multiple functions in my stories. First of all, it’s a touchstone for my characters, which is how I feel about it in my own life. In nearly every memory stuck in my head and heart there’s food lurking in the background. What I ate is inextricably linked with who was with me, where we were, and how I felt. I guess that’s why I can never remember where I put my sunglasses or whether I locked the back door, but I have perfect recall about the carrot cake I shared with my mom in a little café in LaConner, WA thirty years ago. Second, food is a metaphor for love, for sharing, in many cases for work, and even for life itself. Since I love to cook and eat, alone as well as with friends and family, it’s inconceivable to me that I might write a story that doesn’t include food in some way. Food and eating can telegraph information about a character without coming out and saying it. What and how you eat says a lot about who you are. For instance: My father will eat one bite of each thing, going around his plate repeatedly in the same order. Everything has to come out even. If he has mashed potatoes left, but no peas, he’ll take just enough peas to finish off that last bit of potatoes and the last piece of meat. In Bread Alone, I wanted to reveal Wyn’s character using the way she thinks about food, especially bread. This is the first book of the trilogy and it includes flashbacks to a much younger Wyn and the discoveries she makes about bread and also about herself. Food can have other subtexts, too. It’s not always warm and fuzzy. Think Snow White and the poisoned apple. It can be used to seduce or bribe or deceive. In The Baker’s Apprentice, there’s a scene in a café where the food—wonderful as it may be—is only the tip of the iceberg. “Our dinners are beautiful. Mac has medaillons of New Zealand lamb with a Dijon crust, and sumptuously artery clogging scalloped potatoes. I go with seafood, since we’re on an island, even if it’s not local. But it’s so fresh it might as well be—a fat tuna steak, grilled with garlic and herbs just to medium rare. The salad of spring vegetables is local—tiny perfect squashes, new potatoes the size of your thumb, sugar snap peas and haricots verts—everything fresh and sweet, tossed in a warm hazelnut vinaigrette. Even the bread for each dinner is different. He has buttery whole wheat dinner rolls and I have a chewy peasant bread, rubbed with garlic and bearing the marks of the grill. Instead of dessert, we opt for a cheese plate to go with the rest of the expensive-but-worth-every-penny wine. With it comes a little bowl of partially frozen red grapes. When the check comes, he barely looks at it, just pulls out his virginal MasterCard and tucks it inside the folder. I reach for my wallet. “Wyn,” he says, “don’t do this, okay?” His eyes are a warning all by themselves. 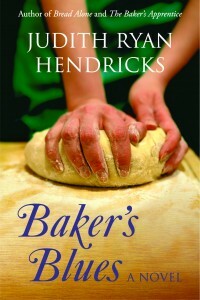 In Baker’s Blues, it’s about the fire, about reducing breadmaking—and paring down life—to its most essential elements. “By the following week, baking every morning, I bring forth some ciabatta that Alex is willing to use in the café. It’s not my finest effort, but people go nuts over it, ripping off chewy hunks and dipping them in the golden green olive oil and sea salt he’s started putting on all the tables. So now you’ve had a small taste of some of the stories I’ve cooked up. One thing is certain: each one is a different process. Sometimes words pour out as if there were a direct pipeline from my heart to the keyboard. Sometimes it’s more like a day job. The truth is…the book that you finish is not the book that you started. The writer—just like her characters—is not the same person at the end that she was at the beginning. That’s what’s so amazing and engrossing and frustrating and exhilarating about cooking up stories. And that’s why, so long as I can see the computer screen and prop myself upright in my chair, I’ll probably never stop. Judith Ryan Hendricks was born in San Jose, California, when Silicon Valley was the Santa Clara Valley, better known for orchards than for computer chips. 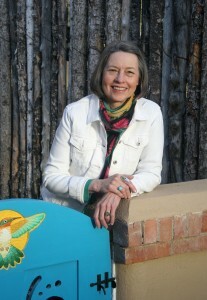 Connect with Judi at her website, judihendricks.com. Guest Post: Cooking Up Stories by Judith Ryan Hendricks, Author of Baker’s Blues by Melissa Bartell is licensed under a Creative Commons Attribution-NonCommercial-ShareAlike 4.0 International License.